Amica Insurance once again received “Highest in Customer Satisfaction Among Auto Insurers in the New England Region” in the J.D. Power 2017 U.S. Auto Insurance StudySM. This marks the fifth consecutive year in New England and the 18th year in a row that J.D. Power recognized Amica for customer satisfaction with auto insurers. Amica Insurance once again received “Highest in Customer Satisfaction Among Auto Insurers in the New England Region” in the J.D. Power 2017 U.S. Auto Insurance StudySM. 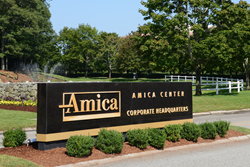 Amica’s score of 875 (on a 1,000-point scale) was 64 points higher than the regional average, and the highest score of any other region. The study measured customer satisfaction across five areas: interaction, policy offerings, price, billing process and policy information (formerly billing and payment), and claims. To learn more about the study, click here.